In January, 1785, Dr. John Jeffries, a Boston physician, made an eventful trip across the English Channel in the balloon of aviation pioneer, Francois Blanchard. Jeffries, a Loyalist during the American Revolution who doctored the British Navy and left with the British troops for Halifax, was also an avid hobbyist ballooner. Blanchard was a well-known early participant in the early balloon flights which inspired a “balloonmania” in Europe. Decorative items and even clothing were detailed with images of balloons or styled au ballon. There was even a hairstyle dubbed à la Blanchard. Jeffries financed Blanchard’s entire trip, though he was taken aboard only under strict conditions, having had to promise Blanchard he would jump overboard if necessary to reduce the weight. Preparing to depart, Blanchard put on a weighted girdle to up his weight and avoid taking Jeffries “which wasn’t very fair,” in the words of the 1916 account of Some interesting Boston events. 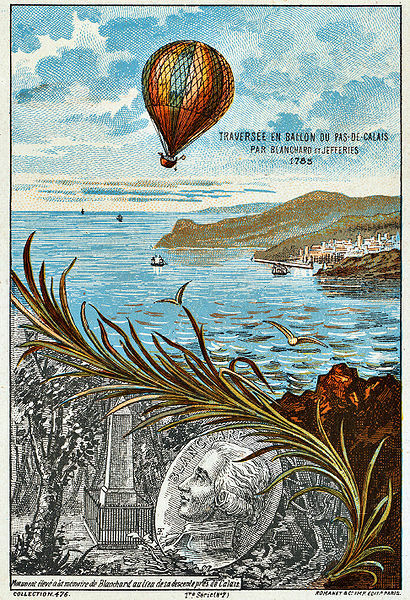 This entry was posted in Science&Tech and tagged American Revolution, Aviation, ballonmania, Balloon, English Channel, Francois Blanchard, John Jeffries. Bookmark the permalink.